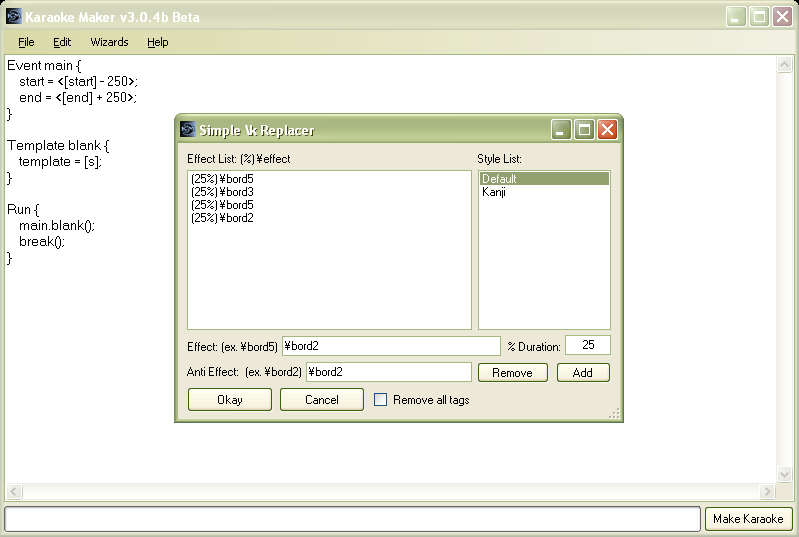 Karaoke Maker 3 or KM3 is the third iteration of the karaoke making tool that let's you do more in less time. KM3 has been redesigned from the ground up to make it easier and faster then ever utilizing a new scripting engine and introducing many new tags with plenty more planned in future updates. KM3 works by letting you design the effect for one line, syllable, and / or character and then applying that effect to all other lines, syllables, and / or characters doing all the math for you. There are many built in functions called tags which can do things from returning a random number to alternating between different effects each syllable. You can get help by posting in the KM3 forums at http://forums.draders.com in the appropriate section.